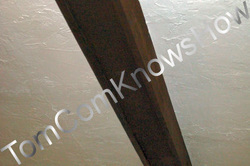 Boxed Beams, a simulation of heavy, solid, structural beams can add a warm rustic look to any room. They appear in many styles; smooth, stressed, or recessed with an 1/8" reveal. You could build Boxed Beams or 'Faux Beams' out of weathered barn siding, face milled barn beams, or reclaimed lumber. You could make them out of Oak, Cherry, Mahogany, Knotty Pine, Yellow Pine, Ash, Cypress, even Cedar wood. Use Boxed Beams to conceal plumbing, electrical, HVAC ducts, low voltage recessed lighting or home security devices. Boxed Beams are commonly made of 1' or 5/4" boards attached to a 2x4 or 2x6 inch nailer commonly secured to ceiling joists with 3" deck screws. 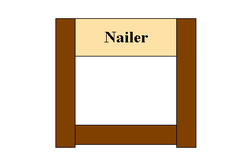 The three sided box then usually attached to the nailer with 2-1/2" finish nails every 12"-18". The nailer setting the width of the beam. 1. Miter the corners of the bottom and side panels and assemble with wood glue & finishing nails, to give this simulated Boxed Beam a solid one-piece look. After applying a bead of wood glue, lay the bottom board down with a side board at a 90º angle. Nail horizontally into the bottom board. 2. Simulate hand hewn lumber by stressing or 'antiquing' with a belt sander, a sharp draw knife, wood carving chisels or an adze to give them an authentic rustic look; before staining, painting or varnishing. To do this, you'll need to assemble the three box sides and attach them to a temporary substitute-nailer for support. With the beam on the floor or on saw horses, use your tools to create chips and scallops and gouges along both the flats and edges. Be mindful of the finish nails! 3. Create a recessed look, which is the quickest and easiest way to construct Boxed Beams. Scribe an 1/8" line down the length of both side panels. Lay one side panel down on saw horses with the scribed line facing up. Set the bottom panel on top, at a 90º angle, line it up and quick-clamp it in place. 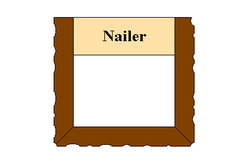 Using a nail gun, loaded with 1-1/2" finishing nails, nail upwards into the bottom panel. Lay the other side panel down, with the scribed line facing up, and repeat the process. * If you are doing this job solo, rent a Drywall Jack and a T-Bar to raise and hold the beams in place while you attach them to the nailers. * Stagger your joints, when extending the length of your beams, for stability.